Today we went on a quest. Let me stop you before you get really excited and think it is going to be some life-changing post about a spiritual quest, or a quest which resulted in some type of earth-shattering self-actualization. It wasn’t anything like that. It was a quest of such insignificance, I find it hard to believe I am actually sharing this with you. We, we being my husband and I, went in search of the elusive perfect black wood screw. Yup, there it is, we spent the day looking for an 8×2 ½ inch black wood screw (or actually 2 8×2 ½ inch wood screws). It turns out, these types of screws are very hard to come by. Why did we do this? Because we had a gate and fence replaced. Mikey, our Great Dane, loves to stand with his front paws up on the fence, and stare over it. He is very nosy. But he doesn’t gently place his feet up there, he takes a running leap and flings himself onto the fence. Our previous fence did not fare well under this abuse, and so it had to be replaced. But, when it was replaced, the latch was not installed to my husband’s liking and hence the need to find longer screws, in black, in which to attach the latch more securely. Who knew there were such things. Then you are saying to yourself, but why a whole day, spent looking for these screws. Ummm – you might need some backstory on this one. Suffice it to say, my husband doesn’t settle for anything, it has to be perfect. P-E-R-F-E-C-T, perfect. Suffice it to say, we spent an entire vacation in Maui looking for the perfect black penny loafer, the ones with the notches in it, so you can put the penny in it. Who searches for penny loafers in Maui? My husband – that’s who. Most people search for shells, tropical clothing, paintings of dolphins, stuff like that while vacationing in Maui – but no, we looked for penny loafers. Did we find them? Yup! Did he ever wear them? Nope, well maybe once and by that point they were so coated with years of that white substance which comes from the ultrasonic humidifiers, they were grey. Have I ever let him live this down? Nope! Back to our quest. This was actually the second installment of our quest. We had tried to find these black screws at one hardware store yesterday and then given up. 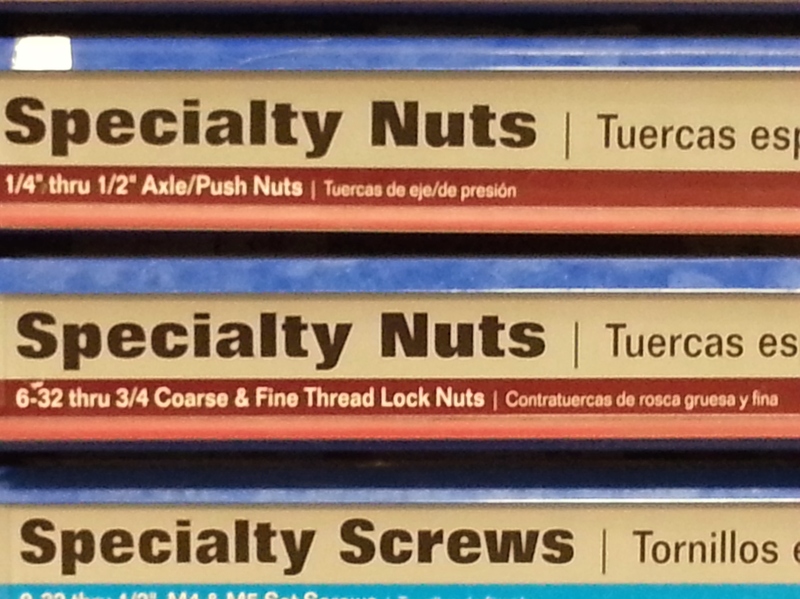 Today we went to the super hard ware store in hope that they might have these screws. My husband searching for that elusive wood screw. While waiting for my husband to search every bin of screws, I found some most interesting things. I thought they were interesting. And here is something to ponder. You know how they have comfy chairs in clothing stores and shoe stores for the husbands to sit on, while waiting patiently for their wives to try on clothes? How come they don’t have comfy chairs for the wives to sit on, while waiting for their husbands to do their shopping at the super big hardware stores? Just saying – I think that is a brilliant idea. Hmm – this seems like a handy thing. Back to the interesting things I found. 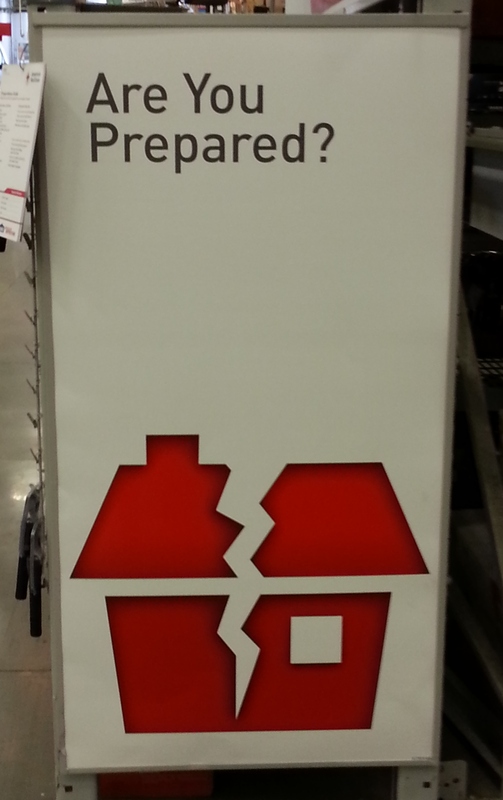 While lollygagging around, I discovered the Earthquake Preparation Center. It had some of the most fascinating items, such as little sticky things you can put under your knick-knacks so they don’t go slip-sliding around during a quake. Or the straps to hold furniture to a wall, or secure TVs so they don’t topple over. And then there were the survival backpacks which touted having enough stuff in them to keep one going for three days. They were small, I can’t imagine them having enough stuff in them to keep a person going for three days. Would this make dusting easier or more difficult? Ummm – I don’t think so! 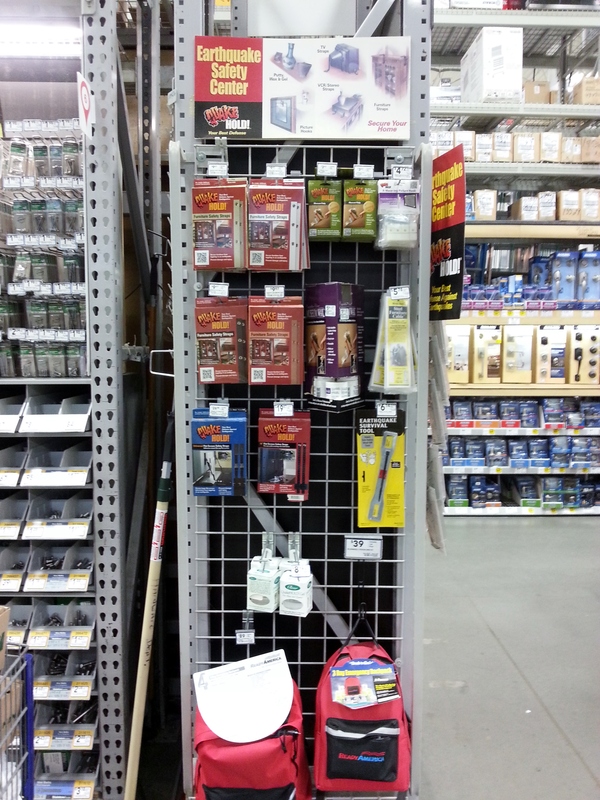 All of this makes me wonder if perhaps the super big hardware store people know something we don’t know. I specifically asked when interviewing for this job out here if we would be living on an earthquake fault and I was told no. Perhaps because we reside in an area 3 hours from San Francisco and 3 hours from Los Angeles, we might suffer from the aftershocks. I don’t know. However, it was a bit disconcerting to see these items for sale. Did we ever find the elusive perfect woodscrews? Oh no, we did not. Was the gate fixed? Yes it was. How, you ask? Ummm, using silver 8 x 2 ½ screws. Sometimes second best is good enough. Thank heavens they had silver ones in. They had boatloads of silver screws, a plethora I tell you!!!!! Ha! Hahahaha Mr Sparkly Pants and his perfect penny loafers in Maui he never wore, coated in years of yuk. Bless his heart! Tee-hee!!! That’s a good one. I think we came to the same conclusion that it was the biggest waste of time. He decided he was going to color the screws in after installing them. Mr. Sparkly Pants – that’s great!!!! Black sharpie works great! Thought you’d like that! But he doesn’t get to wear gold lamé hot pants. I haven’t figured it out just yet, but it’s definitely flashy! That’s what we were going to use – a black sharpie. Great minds think alike!!!! Oh yes, spray paint could be a bit messy! Hmm, definitely don’t want my knick-knacks getting out of place during earthquakes. I’d better get down the EPC at some point. Took me a minute to figure out what the EPC was! Duh! 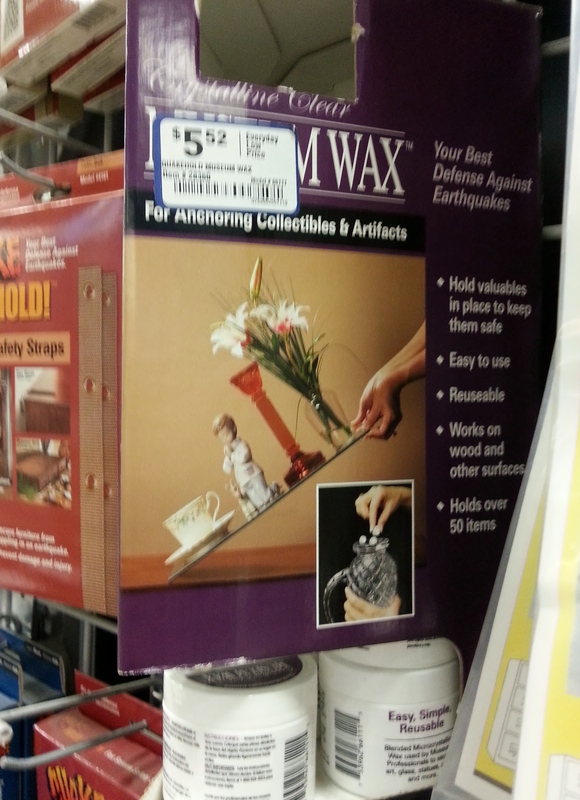 Isn’t it rather unsettling to think that your knick-knacks are stuck to furniture. 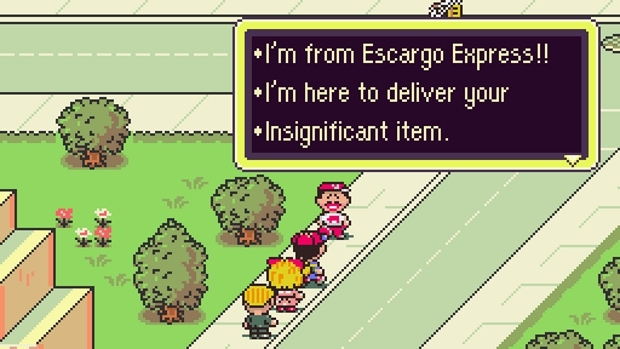 I don’t know why that bugs me so much. I totally love your idea for comfy chairs at the hardware stores (do I sound Californian by saying ‘totally?’). We have a new one (store) here where we moved that we didn’t have in Florida. OMG, I’m never going there with the hubs again … unless of course, they put in those comfy chairs. We had hurricane disaster supplies in Florida. Most important thing before food and water for me, was an air conditioning. We had a small portable a/c on wheels. We bought a generator that could run it and our refrigerator and that’s all. Plus, we had all that freeze dried food supply stuff. Brought everything with us in the move except for the portable a/c. We have to look for a humidifier here soon. 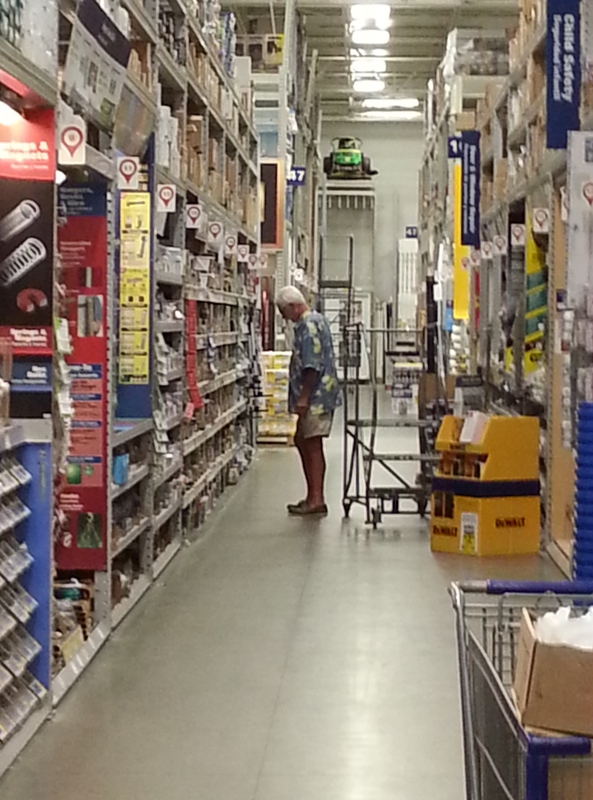 Sorry your husband didn’t find what he was looking for, but it sure gave him an excuse to visit hardware stores, no? P.S. I can just picture Mikey’s head and paws peeking over the fence. Hi Lori, when we lived in Jacksonville, we went through 3 hurricanes. We, unlike you guys, were totally unprepared. On the first hurricane I went looking for flashlights, all the stores were out – I ended up at Toys R Us buying Power Puff Girls and Scooby Doo lanterns. They worked great, put an amazing amount of light out. I wish we had had portable AC, it was horrible the next couple of days waiting for the electricity to come back on. I will have to get a picture of Mikey for you, stickybeaking over the fence. It is quite a sight, he is such a long, thin dog. Would love to see a pic of Mikey in that position. I will work on it this weekend. Now that our gate is secure!!!! Take a sharpie to that silver screw! That’s what I said – or black fingernail polish. Perhaps too simple a solution. And men like to call us complicated! Isn’t that the truth. We look for the easy way out that’s why we live longer!!!! I hate shopping, especially when my partner goes back to the very first shop we went to and buys that shirt! Four hours later and I’m ready for a drink! In answer to your question, that would have been the most reasonable thing to do, and besides we have comfy chairs at our house, in which I could have sat and not had to stare at the Earth Quake Preparation Center. I ABSOLUTELY will not go clothes shopping with my husband, he does the same thing, goes to a gazillion stores and ends right back up at the store we started at. I would rather be disemboweled by a dull knife than have to endure that. Beautiful story, SD. But there are now many people in your area who must re-hide their keys. Just saying. 😉 You wood-screwed them, but good, with the big photo reveal. Ha – I just saw this comment – how did I miss it? Such funny guy. 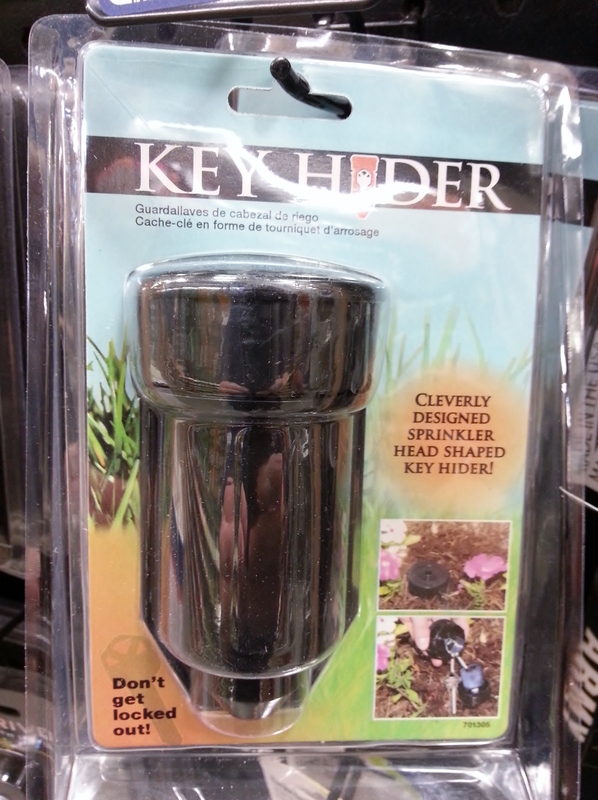 You are right, I have ruined it for the irrigation head/key-hiding people. Of course, I would get one of those and then wonder why it didn’t kick on, probably spend the whole afternoon trying to repair it and then realize it was a dummy irrigation head. I came back to this post because I couldn’t remember what our quest was about. How sad is that? Umm decoy irrigation head – pointing out to all the would be robbers that the keys to the castle might be there. That kind of stuff. Oh, I remembered. I was trying to be cute. Oh, failure! Yes – comfy chairs in the hardware store (or the electronics store) – brilliant idea! I think I should mention it to someone!!! But who?